How much money is required for the event tent rental deposit? Reservations are CONFIRMED when a deposit of 30% of the rental charges has been received. Deposits may be made by phone with a credit card or by mail with a check. You may also pay in person by credit card, check or cash. When should I reserve my equipment? We recommend that you place your order as early as possible prior to your event. Quantities are limited and availability is on a first-come, first-served basis. This is especially important during holiday times and during the busy summer months. We will always try our best to accommodate your last minute needs. Our priority is to make your event smooth and successful. Connect with us now. Final payment is due prior to or at the time of delivery of the rental equipment. Please call or email to make a reservation. Include a contact number in your email with the request. Reservations are only CONFIRMED when a deposit of 30% of the rental charges has been received. Deposits may be made by phone with a credit card or by mail with a check. You may also pay in person by credit card, check or cash. Please be sure of your rental needs and event dates. Cancellation of your reservation will result in forfeiture of deposit. Reasonable adjustments (not full cancellations) to your order are taken under consideration. Will you give me a quote for my event? We are happy to give you a quotation. However, a deposit must be made before a quote can be converted to a confirmed reservation. We deliver for minimal charge to the entire Denver area within 15 miles of downtown Denver. Minimum charges may apply for longer distances. As most events are on the weekend, we make our deliveries on the Thursday and Friday prior to the event. Pickups are made after the event on Sundays or Mondays. Please call us a few days prior to the event to discuss which day your items will be delivered and the approximate time. Can I change my order on the day of delivery? Our trucks are mostly loaded the day before the delivery and usually leave for their routes early in the morning. Once equipment is loaded and has left our warehouse for delivery, we unfortunately cannot reduce or cancel the rental charges. What if my event is on a Sunday and you are closed? No problem, we will have you setup for your event in advance and will pick up a day or so after the event is over. Special consideration can be made for some events when prior arrangements have been made. What happens if items are damaged or lost? Responsibility for equipment remains with the customer from time of receipt until time of return. Please be sure equipment is secured when not in use and protected from the weather at all times. The customer will be charged the replacement cost for damaged or missing items, including boxes, crates, and carts. Are there any cooling options for hot, humid weather? We can provide fans to circulate air and air conditioners to cool the tent and remove humidity. Delivery and pick up rates are quoted as a round trip fee and are based on the time and the location of your event. We do not offer a one-way rate. Additional charges apply for after-hours deliveries, weekends and holiday deliveries. Depending on your location, there is a minimum order amount that must be met before delivery charges are applied. Ask your Event Rental Specialist for details. Can I specify a delivery / pick up time? We understand that there are times that it is necessary for delivery and pickup to be at a specific time and we can accommodate this for a nominal fee. Please make these arrangements as early as possible. No, you do not. If the order is PAID IN FULL, we will drop off and set-up at the pre-designated spot as requested as long as there are adequate set-up instructions. Does your crew set up the equipment? Setup of all tents is to be completed by only by Benson Tent Rent. The general setup / takedown fee of all rental equipment is 10% of the total cost of the rental items on the order. Other charges may be applied due to atypical set-up conditions such as: uneven grade at set up site, long distance moving by hand or unusual set-up surfaces (gravel, asphalt, concrete). What if the weather turns cold? We offer sidewalls and tent heaters to rent for all of our tents. Our heated tents can keep you and your guests warm in most conditions. Can you put tents on concrete, decks and other hard surfaces? 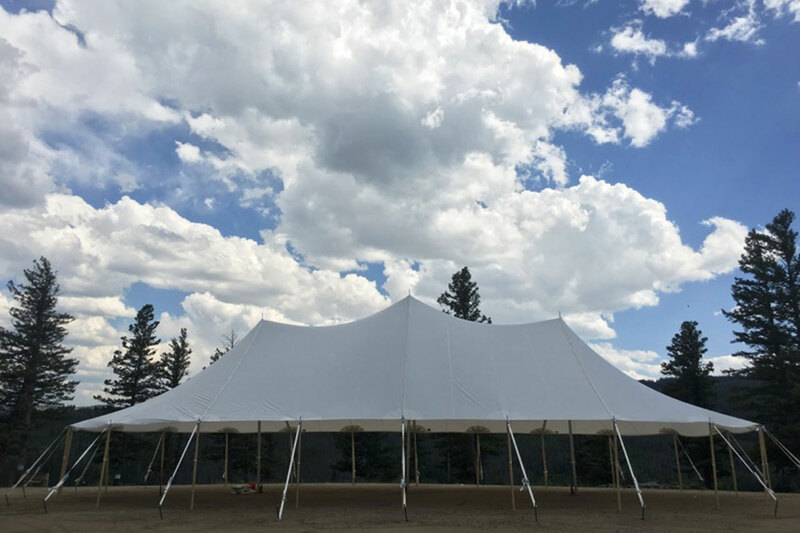 Benson Tent Rent provides professionally installed tents. Some of these tents can be secured with staking or special anchors. Do you have an emergency phone number? For an emergency affecting life and safety call 911. The damage waiver is 10% of the total rental and covers reasonable, accidental damage to the equipment. It is optional and is non-refundable. If the damage waiver is declined and any rental items are damaged, the customer will be responsible for the replacement charges for damaged items. We offer full Liability Insurance. We are happy to supply a certificate of insurance upon request. Tenting may require a permit. Our Event Rental Specialists are happy to assist you with this process. Permitting requirements vary from city to city. Please contact the jurisdiction where the tent is being installed. Who is responsible for the equipment? The customer is responsible for the security of our equipment while in their possession. Please make sure that all items are in a secure location and protected from the weather. Missing and broken items are billed at replacement value and these charges are payable upon ‘closing’ of your order. If items are found after this time, we will promptly issue you a refund. What do you do about electric wires and sprinkling systems in my yard? We call the appropriate Joint Utility Locators. They locate and mark underground public utilities. We try to avoid sprinkling systems but since they are almost impossible to detect we cannot be held responsible for hitting them. The customer is responsible for telling us about anything that might interfere that is not a public utility. Are your tents fire retardant? Yes. A copy of certificate of flame resistance will be provided for each tent upon request. Do you have a recommendation for transportation? Yes! Denver Party Bus provides the best luxury transportation in town. They have a number of different vehicles to choose from so you’re guaranteed to find one that fits your style and needs.